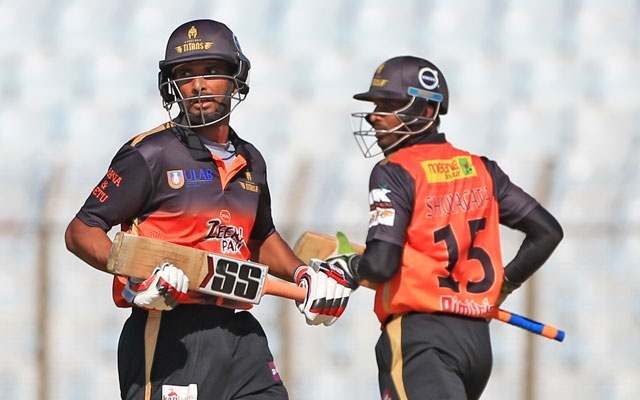 The 3rd spot holders Khulna Titans won the toss and elected to bat first against the table toppers Comilla Victorians in the 39th match of the 5th Bangladesh Premier League (BPL) T20 at Sher-e-Bangla National Cricket Stadiumon Tuesday. Both Comilla and Khulna are through to the knockouts. A win for Khulna will take them up to second place pushing down Dhaka Dynamites. It's pretty tight at the top of the table at the moment as the teams vie for a top-two finish. Comilla have 16 points from 10 games while the 2nd-placed Dhaka and the 3rd-placed Khulna are both on 13 points each from 11 games apiece. Rangpur Riders are in the 4th place, just a point behind on 12. Khulna Titans: Nazmul Hossain Shanto, Mahmudullah Riyad (captain), Nicholas Pooran, Ariful Haque, Carlos Brathwaite, Abu Jayed, Mohammad Irfan, Afif Hossain, Benny Howell, Michael Klinger, Mosharraf Hossain and Rubel Hossain. Comilla Victorians: Tamim Iqbal (captain), Imrul Kayes, Al-Amin, Mehidy Hasan, Raqibul Hasan, Mehedi Hasan Rana, Jos Buttler, Marlon Samuels, Graeme Cremer, Solomon Mire and Shoaib Malik.